The Aspen Ski Co. has renamed the lower half of Little Percy's "Gretl's" in honor of Gretl Uhl. The following article was written prior to the dedication which was on April 7, 2002. A movement is afoot to have a trail on Ajax named after beloved resident Gretl Uhl. She was said to have a love for the mountains matched only by a love for great food. There is a movement afoot to get a run on Aspen Mountain named for everybody's favorite local Bavarian. And it's beginning to look like there will be an international incident if the Aspen Skiing Co. doesn't come through. Local cameraman and television producer Greg Poschman recently sent out an e-mail to a couple dozen friends asking them to sign up if they think a trail should be named for Gretl Uhl, who recently died from cancer. The letter reminds people of Gretl's long history in Aspen. She moved here in 1953, taught skiing for 10 years and ran Gretl's restaurant on Aspen Mountain (now known as Bonnie's) for 14 years. It also asks readers to send it along to others who might be interested, and that is what's given the effort an international flavor. "This letter about Gretl has been to Holland and France and California and Florida. It's been kind of bouncing around the world. It's like she's on this road trip," Poschman said. He suggests that the trail that runs directly behind Bonnie's, Little Percy, be renamed Gretl's or Gretl's Strudel. Aspen Skiing Co. vice president John Norton said the suggestion is being taken very seriously by the company's top management. "We're looking seriously at that idea and should have a decision soon," he said. A few things need to happen before a decision is made, however. At the top of the list is determining the history of Little Percy. Some, like Poschman, believe it was named for a mining claim of the same name. That will help if it's true. But Norton said there is a chance the run was named for Percy Rideout, a member of the Army's 10th Mountain Division, the highly decorated division that fought in Europe during World War II. Norton said he would be willing to talk with anyone who remembers. He can be reached at 925-1220. The decision to rename a run for a person also requires a recommendation from the company's management. Once one is made, it will be passed up to the Crown family, who, as owners of the Skico, have the final say. "Look at all the people beloved by this community. We have to be pretty selective about who we choose to name runs after, or we'll run out of runs," Norton said. "It's not a question that gets a quick answer," he said, adding that Gretl is a very strong candidate for having a run named after her. "If it doesn't happen I understand, but we're hoping something can come out of it," Poschman said. Regardless of the answer, the effort has started something that goes beyond ski trails and e-mails. Poschman has received a number of replies from people who have included stories about Gretl. 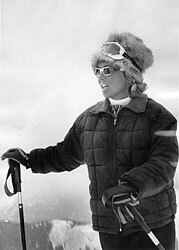 Martha Madsen, for instance, wrote about Gretl teaching her to ski in the late 1950s. "The cool thing about this is people are starting to send anecdotes about times with Gretl going back to the 1950s." A Web site - www.gretluhl.com - has been set up by Tony Uhl, Gretl's son, to receive people's stories and thoughts about Gretl. "Gretl moved here from Bavaria in 1953 with her husband Sepp," Poschman's e-mail explains. "Gretl was a fantastic skier. Her love of the mountains and skiing was matched only by her love of good food. After working as a top instructor at the Aspen Ski School for 10 years, she opened her famous Gretl's restaurant in 1967 and operated it for 14 years — at the current Bonnie's restaurant location on Aspen Mountain. "Today, Gretl's symbolizes an historic era of skiing culture in Aspen. The magic of Gretl's Restaurant was not only her home cooked Bavarian cuisine, but the atmosphere of conviviality which locals and visitors recall to this day," the e-mail reads.